This downtown Indianapolis apartment complex wanted a rooftop pool to help build a sense of community. Stainless steel was the answer here, writes Gary Novitski -- a shell that allowed for a stylish, vanishing-edge look up top while keeping everything watertight and safely dry below. As a mixed-use apartment complex in downtown Indianapolis, Ind., the not-quite-modestly named Artistry complex boasts sleek architecture and modern features intended to reflect the community’s long history of skilled craftsmanship as well as its appreciation for the arts and commitment to active, energetic lifestyles. The main building features five stories of urban apartment homes above 68,000 square feet of commercial office space. Two additional buildings provide options for alternative accommodations, including downsized “eco-suites” for those requiring minimal space. One of the highlights of this development is its third-floor rooftop, which features a vanishing-edge pool and sundeck offering sweeping skyline views. The pool was constructed of stainless steel for ease and speed of installation as well as for structural strength, minimal weight and the securing of LEED points for the project. Given the setting, it was also the most affordable and attractive pool option available. As is the case with many multi-unit residential developments, the swimming pool for Artistry was meant to speed the emergence of a community culture and identity. 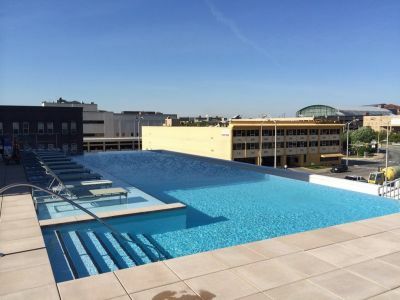 In this case, the developers weren’t after anything particularly large, but they nonetheless wanted their rooftop pool to shine within its surroundings while complementing the modern, artful look of the complex. And as we learned, a firm deadline was a big factor, too. The Summit Division – a stainless steel pool design, manufacturing and installation unit within Indianapolis-based Renosys – was called to the site by yet another Indianapolis firm, Milhaus Construction, which served as lead contractor. They’d already had experience with an elevated stainless steel pool on a different project and had been pleased with the results. Any elevated pool, whether steel or concrete, is entirely dependent on the strength and stability of the support structure on which it rests. These formidable girders and beams (left) are tied directly into the building’s structure – and that assembly was then topped by a lattice of smaller beams and joists to which the pool shell was ultimately attached (middle left and middle right). The image at right is out of sequence, but the space directly below the pool was set up as the equipment room, an arrangement that considerably simplified the hydraulic system. For this project, they asked us to coordinate every detail, from developing the design to working with the manufacturing team and bringing the project to fruition on site. Once we reviewed the overall setting and absorbed both the style of the architecture and the energy of the urban context, a vanishing-edge option was the clear choice – which we proposed and which was accepted. As we saw it, residents of the apartments are mostly young professionals working downtown, so the pool would serve mostly as a gathering place and social backdrop rather than as a resource for lap-swimming or workout-style recreation. The watershape would serve both functions, of course, but the vanishing edge would help set an easygoing mood with its soft background sounds, while a large sun shelf/lounge area within the pool would provide a hangout offering easy deck access. Unlike a prefabricated shell, where the welding would mostly have been completed off site, Artistry’s pool was fitted and welded in place on site – a labor-intensive process in which quality control and careful inspections are of paramount importance. By the time it’s complete, shell penetrations for lights and suction/return lines are the only concern for leaks – an issue we take care of with a detailed process of waterproofing and testing. The pool itself is 20 feet wide and 40 feet long, with large, walk-in stairs. Its position atop the third floor is also significant, in that it offers those in units on the fourth and fifth stories an enticing view of the pool deck below. The mechanical room is hidden directly underneath the pool, creating a gravity-fed flow that simplified the hydraulic system. The smaller pool size was optimal for another key reason: Local commercial building codes require four feet of decking around the entire pool, which was easy to manage beyond the vanishing edge of this particular pool. The size also left us plenty of room for an outdoor cooking area (covered by a pergola/shade structure) and a substantial seating area. All in all, it’s a simple, elegant design – perfectly suited to the space and its intended use and users. For all that simplicity, however, it was nonetheless an elevated pool – a fact that adds layers of complexity to the installation process as well as to all of the planning steps leading up to the day the stainless steel would arrive on site. The choice of a stainless steel shell over the custom-concrete alternative was, in this case, relatively straightforward as a matter of weight, installation efficiency and project timing. The big advantage here is that all of our steelwork could be handled on site, with welding completed in place: This simplified the process of making any necessary minor adjustments to fit the shell within the structure and make certain everything was perfectly level for the integrity of the crucial vanishing-edge effect. Once the shell was complete, we applied a PVC liner as an interior finish on all surfaces – floor, walls, steps, sun shelf and vanishing-edge trough. This material was chosen over tile or finished stainless steel because it is durable and soft to the touch while adding another impervious layer to the overall waterproofing program. The pool system is self-supporting and was secured atop I-beams tied directly into the structure of the building. There’s always concern about leaks at penetrations for suction and return lines and lighting fixtures: These we kept to a minimum and followed detailed, painstaking installation and waterproofing procedures at each aperture to prevent any leakage via what might be described as any pool shell’s “weak” spots. Beneath the shell, the equipment room’s floors and walls had previously been thoroughly waterproofed to contain any incidental water – from condensation, for example, or routine maintenance of pumps and filters – and move it safely to waste. There is no surge tank here: The vanishing-edge trough is designed with enough capacity to contain and manage the water in transit when the system is not in operation. The completed pool, deck spaces and outdoor kitchen make a statement about gracious urban living and invite all of Artistry’s young-leaning tenants to socialize in an open, casual environment. Elevated pools may be a challenge for designers, engineers and installers, but it’s easy to see why owners and managers are turning them into in-demand design elements. Within the steel shell, it was decided for this particular installation to go with a PVC membrane – just one among available lining options (including tile or plain stainless steel) for these vessels. Here, the choice of PVC was driven by its modest cost, great longevity and blue color, which was seen as perfectly complementary to its cool, urban setting. And not only does PVC look right: It also feels great, offering a nice, soft surface that is pliant to the touch, making it particularly appealing for people who are mostly sitting and standing in the pool rather than swimming in it. Then there’s the fact that the PVC layer is effectively impermeable, adding another measure of control within the overall waterproofing system. In the past few years, the use of stainless steel pools in elevated settings has grown dramatically. As was the case in the project described here, they’re light in weight, install quickly (which was a key factor for Artistry’s management) and have a profile unmatched by concrete when it comes to holding water for the long haul. As awareness of these benefits has grown, these vessels are more and more frequently included in upper-story projects – and that brings a challenge: As they become more common, chances increase that they’ll be handled by those who are less than thoroughly versed in the finer points of their design, fabrication and installation. If there’s anything about elevated pools that needs to be kept in mind, it’s that they’re small (but important) components in overall construction projects in which the stakes (and the liability) are sometimes incredibly high – meaning these are not projects to be approached by inexperienced watershapers left on their own. The stresses were high enough even in the relatively straightforward project described in this article. Just imagine the scrutiny to be faced with an ultra-high-end luxury apartment and a rooftop pool where the contractor would need to guarantee a complete lack of cracks or leaks within multimillion-dollar penthouse units and for all the equivalently high-end units below them: Nothing really changes procedurally, but the gut checks are punishing and the consequences of errors can be unimaginably costly. As with so many leading-edge projects, it’s best to recognize what’s at stake – and seek help from consultants, engineers and manufacturers who know the right path. With that level of support, the sky’s truly the limit! Gary L. Novitski is vice president of the commercial division at Renosys , the Indianapolis, Ind.-based manufacturer (among other products) of stainless steel pools and spas. He has more than 15 years’ experience in the commercial aquatics industry. For more information, visit http://www.renosys.com/summitseries%E2%84%A2-elevated-pools.html.